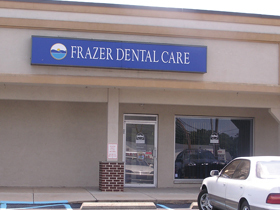 If you are looking for dentist in Frazer, PA, look no further than Frazer Dental Care for all of your dentistry needs. We are proud to have a highly educated & professional dentist in Frazer that can help with any & all of your dental care needs & can do so right here in your own community to make it easy on you. In fact, making your dental care & dental hygiene our priority, Dr. Kesari & her staff in Frazer have extended hours as early as 7:30am & as late as 7pm & we even offer Saturday appointments. If convenient appointments that are made to work around your schedule are what you are looking for, Dr. Kesari, working extended hours, is here for you. Even if you simply have questions regarding your dental care or any treatment, our dedicated staff is waiting by the phone to answer them for you. Conveniently Located Dentists in Frazer, PA! We are located on Route 30, half a mile west from the junction of Route 352, in the Frazer Shopping Center near the Frazer Post Office. Walk-ins & emergency visits are always welcome!